In his classic book “Education and Experience” John Dewey talks about the dichotomy between traditional and progressive forms of education saying that such a dichotomy polarizes discussions around educational matters. Dewey, instead, argued for an experience-based model that builds on the drawbacks and strengths of both models to form a holistic conceptualization of what a student-centred education should be like. Today, as I stumbled upon this beautiful chart on Mindhsift’s Facebook page I could not help but connect it to Dewey’s discussion of experiential and progressive learning. 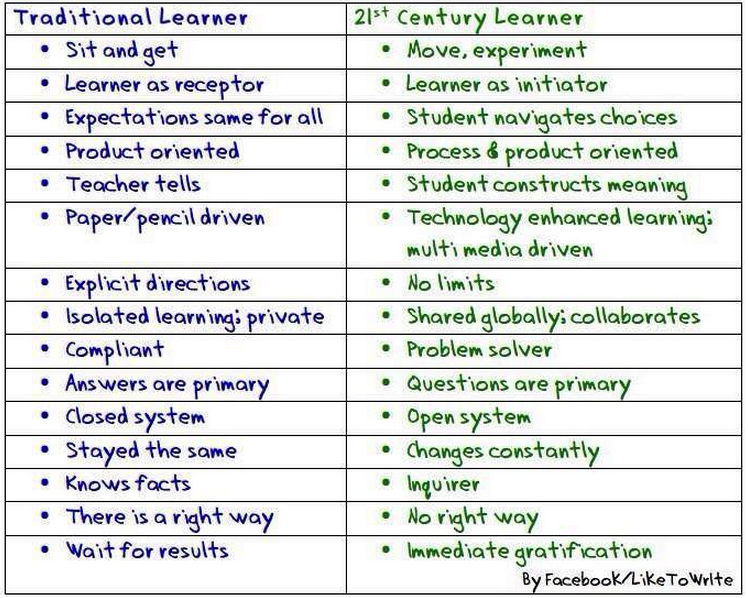 What in the chart is labelled 21st century learner is in fact the kind of learner Dewey theorized in his work more than half a century ago. Therefore, the ethos are not new but the circumstances are different. In my view, dichotomizing traditional and 21st century learning does not necessarily favour the latter over the earlier though 21st century model of learning is what is expected in our classes but more importantly it raises educators critical awareness of the affordances and of inconveniences of each model in the hope of constructing a robust model that meets the learning needs of individual students. This chart is created by Like to Write which has two interesting resources: liketowrite.com and liketoread.com .